Concrete doesn’t have to be grey and drab- it can also be beautiful. The commercial and industrial applications have extreme durability. 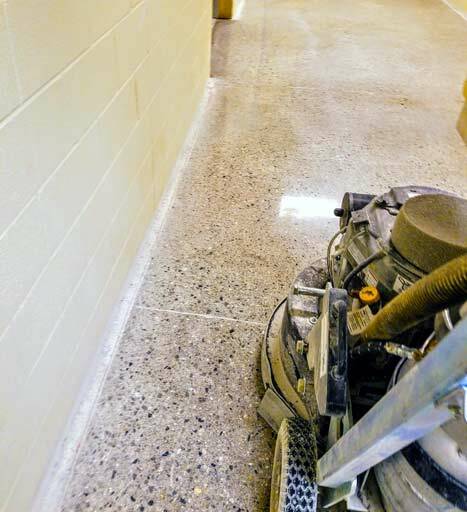 The beauty of concrete can shine through and stay tougher than traditional flooring and last much longer with less maintenance. Here’s some guidelines to understand True Grit Concrete Polishing’s process. Surface preparation can involve removal of old tile to expose the slab underneath. Surface prep includes taking out surface imperfections like cracks or pits. True Grit will fill the imperfections and flaws and level your floor. A fresh pour over a subfloor is another example of surface preparation. Once client’s expectations are met, the grid can begin. Concrete grinding uses of coarse diamond abrasives to get down into the aggregate rock within the concrete. Grinding deeply exposes more rock and exposes concrete’s hidden beauty within. Results of your grind can produce a rock like surface or a granite look that becomes harder after further True Grit enhancement treatments. 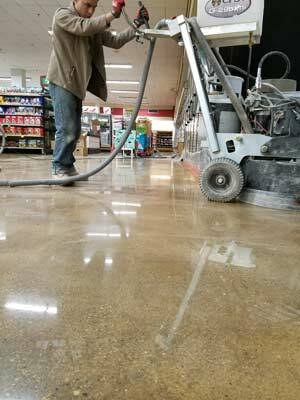 Concrete polishing produces the sheen or luster that you desire. The polishing process uses fine diamond grit buffing to your expectations. The finer the grind, the higher the sheen that can be achieved. Dyes may also be used to further enhance the appearance of your floor. A concrete maintenance plan chemically treats and seals in extra hard durability and beauty to protect your floor even more. Elasti-Deck is used to protect the surface from wear and tear and weathering. Maintenance plans apply guard treatments regularly, which greatly improves the durability and life of your poured concrete investment. Ask about True Grit Maintenance Plans that will buff and treat your floor regularly. Added protection will enhance your polished concrete floor’s beauty and durability. A concrete guard application is included with every job, the guard protects the concrete and enhances the shine created from polishing. Ask us about a maintenance plan for added durability. The maintenance plan chemically improve concrete’s impervious nature and hardens the surface against scratches and heavy wear and tear. Institutional applications use True Grit’s maintenance plan to extend durability into the concrete, chemically. After numerous applications, your polished concrete’s strength and ability to repel abuse is enhanced even more. 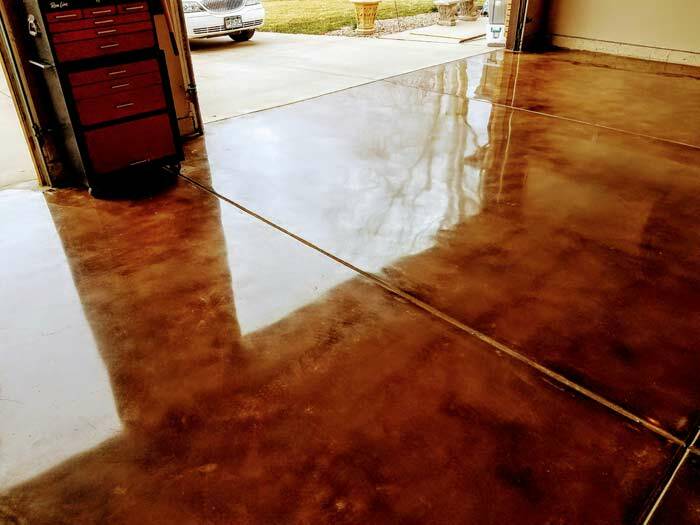 Whether you have an old slab that needs rejuvenation or a newly poured slab, a concrete floor may be what you’re looking for. If you would enjoy a rugged and beautiful floor underfoot, we can help, whether you need a floor for your residence or business. If you would like a quote, call or email us. True Grit Concrete Polishing is located in Cortez, Colorado. If what you have seen here interests you, please call for a consultation and quote. We will meet your expectations.